Local delivery and free pickup options available! I’m behind several days on posting due to the demanding schedule and lack of sleep. The past few days follow a pattern. Up at 7:30 or 8, shower, eat breakfast, check email, discuss work for the day, driver comes at 9ish, meetings 9 until 12 or 1, enough lunch for twice as many people, afternoon/evening out and about with dinner averaging 10pm, work and blog and facebook until 2 or so, 3:30am the night before I stopped posting. I’m too old for this! That almost sounds like complaining, but don’t take it that way, I am enjoying sharing this experience with everyone and don’t want to stop writing. On with day 5. What do you think we had for breakfast? Honey and bread. I sure do miss milk. Haven’t seen any around here. The plan for today is to conduct another workshop in the cultural center in the morning getting into the details of the curriculum. We will lunch there at the cultural center and then the plan is unclear. Hopefully the pool will be involved, but as you will see we never made it back to the hotel until late and the pool closes at 8pm so the pool deck can become a restaurant. Shopping at the bazaar in the market area of downtown Duhok is quite an experience. Ms. Basima told us to take someone with us not for our physical safety, but for the preservation of our cash. Negotiation is part of buying anything in the Bazaar, not like the Mazi Mall, where shopping is boring with fixed prices just like in America. For some reason they have begun constructing western type shopping places. I didn’t come all the way to Kurdistan to go to Wal Mart. So after the morning work and another overly indulgent lunch (I am starting to force myself to eat very small portions although it is observed by the hosts and they don’t like it! 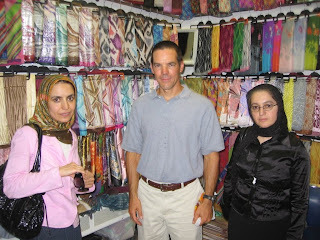 ), Ms. Basima, Ms. Amera, Rahman and myself begin our first bazaar shopping experience. Actually we stopped by a little shop on the way to park the car that had “folk” crafts. Turns out that I saw some of the same things later in the bazaar. We, well Ms. Bassima and Ms. Amera were trying to lower the price on a cool little knitted hat, but the shopkeeper wouldn’t budge so we started to leave. He must have thought we were rich Americans because he went into his shop and came back with a genuine snicker snee for only $500. He said it was really worth $2000. We left and parked the car at the Office of the Deanery of the College of Education. The College of Education will soon be in a brand new building 30 km north of Duhok in a town called Zakho (Zah ho), but for now the College is housed in what was one of Saddam Hussein’s security buildings (read prison) in Duhok. It is not a very pretty place and they showed us a barred door leading to the prison area below ground, kind of like a dungeon. I was told that really bad things happened here with many people killed in the prison. Would you want your office and classrooms in a place like that? 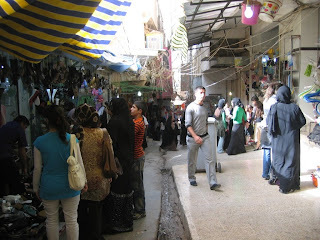 We strolled down to the bazaar area which takes up several blocks if the city was actually laid out in blocks. It is hard to do justice to the bazaar in words. In this instance, movies like Indiana Jones do a decent job portraying the scene. The bounty of colors, textures, sounds, smells, and people saturate my whole being with the experience. Stall after stall and passage after passage are lined with anything you might want from western looking toys, clothes, and accessories made in China to traditional Kurdish clothes and religious scarves and wedding dresses to ice cream and fruit and nuts and vegetables and spices. Before you start thinking it is so romantic, there were also smells that weren’t so good and water running down a little trough in the middle of the walk and trash scattered about, especially water bottles. The people in the bazaar are as varied as the merchandise. Not so in most other places like restaurants where the segregation of men and women is quite clear. At the popular Malta restaurant, the lawn on one side of the sidewalk is for men only while the other side is for families. This doesn’t mean that when your family goes out to eat the fathers don’t sit with their families. It is quite the opposite. The husbands and fathers are with the families. The all men side is for groups of men like soldiers or Coalbiters. It is probably a good idea they have their own space. No such separation exists in the market (or in the University now that I think about it) other than the grouping of like merchandise. One would think you would not want your scarf store next to another man’s scarf store, but this is not the case. Similar stuff seems to clump together. Even out on the street where small store fronts line the thoroughfare, all of the tire shops are adjacent to one another. I asked about this and was told you choose the one you have a relationship with. But how do you choose the first time? 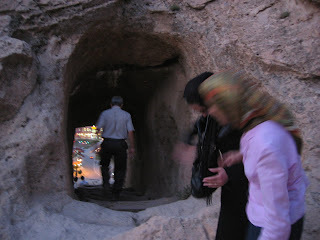 Before entering the labyrinth that is the bazaar, we dropped down some steps below street level to a wide hallway with small offices along the wall. The money changers. We chose one of them (I do not know how) gave them $50 and in return got 50 x 1250 = 62,500 dinars or thereabouts. Ms. Amera said it used to be 3 US dollars to 1 dinar. Times have changed. I do not know why Bassima and Amera even bothered to do this because we were not allowed to pay for much of anything. They said we were their guest, so they wanted to pay for everything. Rahman argued with them every time, trying to pay for it himself. I quickly gave up trying and just thanked them for their kindness. I wanted to buy something for the ladies in my life back home. I forgot to tell you that they first took us to a very chic western looking store to look for something for the ladies before realizing this is not what we were after, and I certainly wouldn’t try to buy any real clothes for Margaret or Shannon. I decided something for their hair would be good, but soon found that hair clips and such were the same as in the US. What about a head covering? Most women had some sort of head covering though a few did not. The dress of the women was really spectacular and very diverse from the black all over to colorful head scarves and dresses to western clothes. However, I could see a good portion of the women were following the western style of tighter fitting clothes just with a head covering on top to satisfy their rules. I was told by our hosts that Turkish women are the most beautiful. 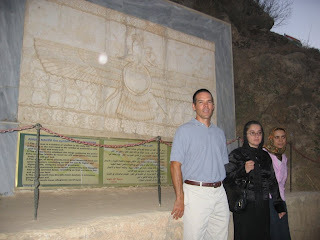 Unless you are of the religious groups that just wore black, it seems to me the women in Kurdistan may have an even more difficult time dressing than women in America because they have to decide on what head covering to wear along with the rest of their clothes and accessories. I ended up getting colorful head scarves for Shannon and Margaret and then a cute dress for Lillian the next day at the market in Zakho. As for the men, some wear jeans and a polo shirt and others dress pants and dress shirt and maybe a coat and tie. Most wear short sleeve shirts unless they are workers out in the sun in which case they wear long sleeves. However, there is a group of older men wearing the traditional Kurdish clothes which are baggy pants pulled very far above your waist like my friend Neal Sullivan used to do as a joke, a long sleeve shirt and a big piece of cloth wrapped around the waist as a belt. The piece of cloth looks just like a big sheet. I bought one for Israel to add to his costume collection. Ms. Basima said you have to know how to tie it, probably just like learning to tie your tie. The colors of the belt vary a little, but the rest of the outfit is some shade of green or brown which blends in well with the natural landscape. The bazaar hours run from 10am until dusk, which is 7 or 8. To close for the night, the shopkeeper puts a big sheet or tarp over the front covering any merchandise that is on display. It appears there is nothing to prevent someone from coming along and stealing everything except that doing so is unacceptable in their culture. There are thieves just like everywhere else in the world, but this is not the place where they work. 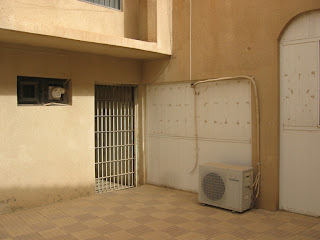 Out on the main street, the businesses have a store front, sometimes it is just like a garage door. They open the door and pull out their merchandise for display or for the tire businesses, bring out their tires and tools for changing tires. The tire changing happens right in front of the store on the side of the street. Ms. Amera said anything dealing with cars is a lucrative business. I should tell my friend Allen Trivette of 194 Tire to come set up shop in Kurdistan! After a few hours in the bazaar trying to decide what to buy and haggling with the shopkeepers, we made a return visit to the Duhok Dam and hiked up the side of the hill to the top of the waterfall that lands in the pool next to the road. I was disppointed to learn that the waterfall was man made. They pump water up to the top of it! In any case, the hike up the mountain was fun with a good view of the Dam. Pictures will help here. We finally headed toward dinner at the best restaurant in town called the Malta restaurant. Nothing unusual happened at dinner except that the restaurant was really crowded this night so the service was not particularly good even though they are famous for their service. We ate outside on the lawn on the family side of the yard. No one was inside the restaurant except for the cooks and the wait staff. We did see one group with the women dressed to the nines with sequined dresses and lots of gold and jewelry. Our hosts said if a man wanted to marry one of the single girls in that family you would have to give them lots of money and gold. I’ll tell you more about marriage another day. Our customary ending to the day followed, staying up late on the computer working, blogging and chatting. Thanks for your wonderful posts. 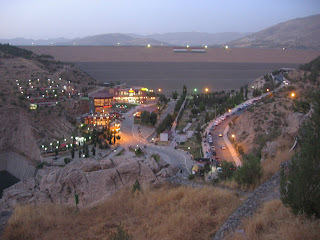 I live in Erbil, but am planning a trip to the dam in Dohuk soon. Was nice to read your accounts of your experiences in Dohuk and view pictures of the dam. Have you been to Halamata? They are on Zawa Mountain near the village of Karfuki. I found that few local people have interest in this place, but it was one of the magical experiences for me… Assyrian ruins sitting completely abandoned part-way down a "mountain".